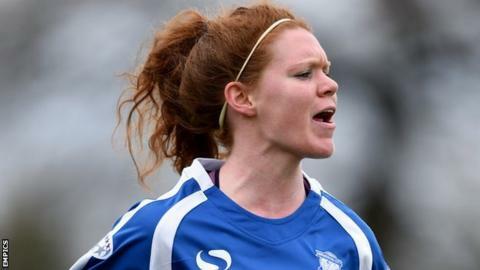 Birmingham City Ladies defenders Aoife Mannion and Meaghan Sargeant have both signed new contracts with the Women's Super League One club. After losing their star pair to Chelsea, England international Karen Carney and goalkeeper Becky Spencer, City had feared other departures. But both Mannion, 20, and Sargeant, 21, are now signed up for the 2016 season. Blues, runners-up in 2012 and 2013 and third in 2014, finished sixth in 2015, narrowly avoiding relegation to WSL2. Blues Ladies manager David Parker said: "Aoife is yet another local youngster who has progressed greatly. Having her at the heart of the team will prove invaluable. "She is no doubt a future leader with great composure and confidence. She has a massive future ahead of her. "Meg is a player of great ability and versatility. She has competed at every level for England up to Under-23s, which shows how far she can go. I really look forward to her putting down a major mark on the team." Birmingham City Ladies' new season is scheduled to kick off on Wednesday, 23 March with a trip to Widnes to face Liverpool Ladies.